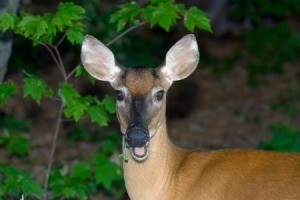 On the list of ways to keep deer out of your garden is the use of objects that move in the wind or reflect light. This page is about how to frighten deer with plastic bags. To keep deer out of your vegetable garden and off of your fruit trees, place white plastic grocery bags on the fence at intervals. The white bags will blow in the wind and the deer will not enter. You can also buy some of those inexpensive (dollar store) aluminum kiddie pinwheels and put them on top of the fence. Any little breeze will make them spin and it does frighten the deer. Using Irish Spring is what I always suggest to deter deer, bunnies, mice, etc. I am a licensed wildlife rehabilitater and do talks about living with wildlife. If you buy some of the little muslin drawstring bags found at feed stores (about 25 cents each) and put a little piece in you can tie them to the fence. If you don't have a fence you can use the inexpensive bamboo skewers and tie them to the skewers. When it rains the soap "melts" and permeates the bag and actually makes the smell stronger. They will last for many months that way. To keep deer out of your garden and eating your vegetables place white plastic grocery bags around the garden fence or on a pole. The wind blowing the bags will frighten the deer away.